Juan Ignacio Sosa, is a Director, Co-Chair and Chief Operations Officer of Portfolio Resources Group (PRG). Mr. Sosa brings extensive experience and expertise in the Emerging Markets fixed income arena, as well as, investments in general. Mr. Sosa has been a registered representative of Portfolio Resources (PRG) since March 2001. 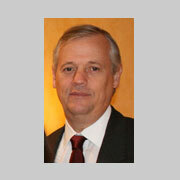 From February 1995 to the present he has been a director of the PRG group of companies of which he is currently Co-Chair, General Principal, and COO. Since October 1996 he has also been a Managing Director and Co-Chair of the Investment Committee at Capital Management Resources Ltd., Tortola, BVI. From 1987 to 1994 he was a Director, Vice-President, General Manager of Incambios Valores Casa de Bolsa, a Venezuelan Broker Dealer and Member of the Caracas Stock Exchange. As such, he was one of the most active bond-traders in the country in both domestic and international markets. Mr. Sosa's wide experience in the financial services industry includes securities trading, brokerage operations, banking, and clearing services. He served from 1992 to 1995 as Director of Inversiones Finalven SA, a Venezuelan investment bank and the largest financial services firm in the country. From 1994 to 1997, he was Director of Sociedad Financiera FIVENEZ, another Venezuelan investment bank and from 1994 to 2001 he was President of PAR-B Mercado de Capitales SA, a Venezuelan securities broker/dealer specialized in trading emerging markets fixed income, equities, and foreign exchange in the local domestic market. From 1999 to 2002, he was Director of Caja Venezolana de Valores, a Venezuelan securities clearing house, and from 2000 to 2001 he was Director of Casa Propia EAP, a Venezuelan regional bank. From 1999 to 2001 he was Director of Factor AG, a Venezuelan financial factoring and Securitization Company. In addition to the financial services industry, Mr. Sosa has broad business experience in manufacturing and construction. From 1987 to 1990 he was Director of CA Cervecera National, Venezuela’s 2nd largest brewery, and since February 1994 he has been a Director of Venequip, SA (Venezuela), Venequip Machinery Sales Corp. (VMSC-USA), Venequip N.V. (Curacao), Venequip Machinery Sales Curacao (VMSC Curacao), the authorized caterpillar dealers for Venezuela and the Netherlands Antilles. Mr. Sosa also worked as a quality control engineer, an engineering design manager, and later as finance manager for IMOSA (Industrias Mecanicas Orion S.A.), a metals works factory owned by the Grupo Vollmer and ATB (Aciaieria e Tubisficio di Brescia) an Italian Group. IMOSA was a manufacturer of large diameter steel piping (over 12 inches) for water and gas lines used in infrastructure projects throughout Venezuela, and also a manufacturer of large pressure vessels used in the petrochemical industry both in Venezuela and in the United States. Mr. Sosa earned a B.S. degree in Mechanical Engineering in 1981 from Boston University. In 1983, he earned a Masters of Business Administration (MBA) degree from Boston College. Mr. Sosa has appeared on ‘CNN en Español’ as a guest of financial news programs such as “Nuestro Mundo” and “Dinero.” Mr. Sosa is currently President of Inversiones Sosabas, a private Venezuelan corporation. Mr. Sosa has a Series 7 Securities License (General Securities Representative Examination) since March 2001, a Series 24 (General Securities Principal) since February 2007, an Investment Banking Representative License since May 2010 and an Operations Professional License since October 2011. Mr. Sosa has also a Life, Health and Variable Annuities Insurance License from the State of Florida since January 2009.